Pressure Cooker Chicken Adobo and Rice is made from pantry items you likely have on hand, and this is so easy to assemble and it looks delicious. Bonus: it’s a one-pot meal because the chicken and rice cook together. This recipe can work for the Instant Pot/Pressure Cooker or on the stove top. There’s also a link below for a slow cooker version of Chicken Adobo so everyone can choose the method they prefer! Click to see The BEST Slow Cooker and Instant Pot Chicken Drumsticks Recipes! Begin this Pressure Cooker Chicken Adobo and Rice from Simply Recipes by blending a handful of pantry staples you probably already have on hand. Combining onion, garlic, vinegar, soy sauce, peppercorns, bay leaves, and a little bit of sugar creates a tangy, salty, slightly sweet sauce which gives the chicken its unmistakably Filipino flavor. To ensure a rich flavorful sauce and tender chicken it’s recommended that a mix of bone-in, skin-on chicken legs and thighs are used for this chicken adobo. If you prefer you could easily use boneless skinless chicken thighs for this recipe. Throw together a salad or cook up some fresh veggies while the Instant Pot/Pressure Cooker does it’s magic. You’ll have a complete dinner ready to serve in less than an hour. Click here for a Slow Cooker version of Chicken Adobo if you prefer that method. Check out all the Chicken Recipes on Slow Cooker or Pressure Cooker. 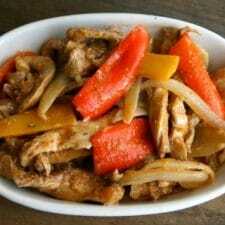 I love chicken adobo! I always make it in the slow cooker with skinless, boneless chicken thighs or breast, cut in pieces, so the sauce is not fatty. I have to try it in the Instant Pot.